The Tech Works DL-1 is a stylish, exceptionally bright Nurse Call Dome Light for use with Tech Works Control Modules, available in all Red, or all White. These are single color passive dome lights designed to work with a variety of Tech Works systems where a simple visual indication is needed in a hallway or above a door or bed. This unit can be paralleled with other passive devices to provide a wide array of output signals associated with user interface buttons. The Housing is made of white ABS plastic and uses 4 acrylic Lite Pipes to disperse the light from 4 High Power LEDs. 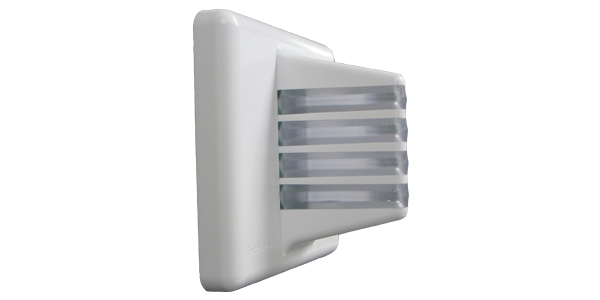 A plastic back plate is included to mount to an industry standard 1 or 2 gang electrical box. Wiring screw terminals are provided for LED +/- and Switch +/-. The switch terminals are not active but provide a splice point for parallel wiring to Tech Works button stations.